Mitsubishi's L200 pickup debuts in Geneva. GENEVA -- Mitsubishi Motors Corp. has rebounded from financial trouble to profitability. The secret, says President Tetsuro Aikawa, is a focus on a few profitable segments: light trucks, crossovers and electric vehicles. Sedans and performance cars, not so much. Aikawa, speaking last week through a translator at the auto show here, said the company expanded too aggressively in the past. Now it will concentrate on segments offering healthy profit margins. "What we have done is we have minimized the development of sedans, and we decided to concentrate on SUVs and pickup trucks," he said. "That's why we were able to recover." Selling a European plant and closing an Australian plant helped, as did the weaker yen, which translates to more yen coming to Japan from foreign currency sales. Aikawa said Mitsubishi will hit record sales in Europe this year. He added that the recovery will extend to North American Free Trade Agreement nations, where he foresees profits in the fiscal year ending March 31. "Finally I can say that in the NAFTA market, we were in the red, but this year it's going to shift to surplus," he said. "We're going to be in the black this year." 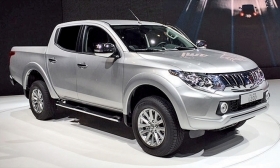 Mitsubishi's push into pickups was highlighted by the debut of the L200 pickup here. Aikawa said Mitsubishi already has one customer: "We are going to be providing this pickup truck to Fiat." Fiat Chrysler CEO Sergio Marchionne confirmed that, saying that the truck will be rebadged as a Fiat in Europe, Africa and the Middle East. He said it would be "undersized" for the U.S. But fans of the sporty Lancer Evolution, which is being discontinued, are out of luck. "Right now we do not have any plan to continue on with the Evo," Aikawa said. "The reason is because our strategy is to shift to SUVs. So, no plans."